VC-400 Indutherm Casting Machine The ideal machine for smaller companies producing moderate quantities but needing considerably more capacity than that offered by the MC machines. Often, experienced casters are not particularly interested in automated functions or program control, and they can achieve the same quality with the VC 400 machine as with more advanced ones. Its induction generator guarantees a fast heat-up and a thorough mixing of the molten metal by inductive bath movement. VC400 Indutherm Vacuum Casting Machine Compact, but efficient: induction technology at a super price! Material can be melted under vacuum, protective gas normal pressure or protective gas over-pressure After casting, the flask can be put under over-pressureSpecification: performance performance max. 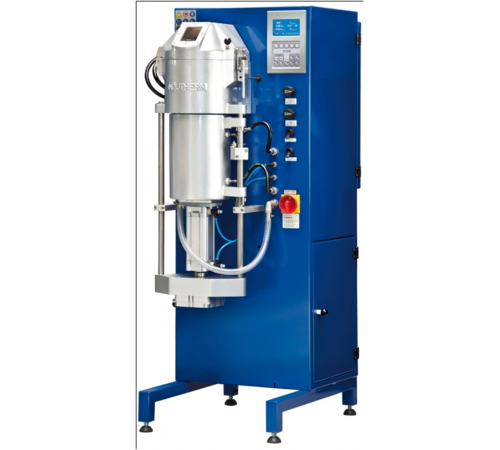 / electrical connection 3.5 kW 230 V or 4.5 kW 3x400 V maximum temperature 1400° C capacity crucible volume 170 ccm = 2,5 kg Au 18 ct * for use of flasks up to ø 130 mm / 240 mm H handling+control program control 20 temperature programs .. The ideal machine for smaller companies producing moderate quantities but needing considerably more capacity than that offered by the MC machines. Often, experienced casters are not particularly interested in automated functions or program control, and they can achieve the same quality with the VC 400 machine as with more advanced ones. Its induction generator guarantees a fast heat-up and a thorough mixing of the molten metal by inductive bath movement. Compact, but efficient: induction technology at a super price!